Other Aliases: The Clown. First Appearance: Spawn #2. Powers/Abilities: A demon from the eighth sphere of Hell, Violator possesses supernatural strength, agility and cunning. He can also perform Hell-Powered magicks. What's the Story? : He is a being built of necroplasm, ego and lies. If there was an "older-child syndrome" he'd have it in spades. He is one of the five "famous" Phlebiac brothers, demons all, servants of the Malebolgia. His purpose is to guide Hellspawn towards fulfilling their master's desire: to cultivate evil souls on Earth. But, because of jealousy, the Violator is doomed to fail. This is his own particular torment. He claims to have been born from the magic of Dr. John Dee in the 16th century, and yet he has dealt with a Spawn in the Middle Ages, four hundred years earlier. His true origin is lost in the mists of time and the fumes of Hell. He brags that he could destroy a Spawn, to its very face, and then whines when the battle turns against him. His fighting is vicious, born of a dog-eat-dog Hell, but not strong enough to overcome his master's pets. The Violator is a contradiction both in form and substance. 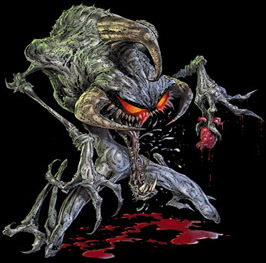 For eons he has been a poisonous, dripping-fanged, spindly, terrifying, spiked demon with a weakness for the taste of human hearts, and it's gone to his head. He has been granted immense powers by his lord, and he simply abuses it, through ignorance and apathy. Sometimes he appears in his Clown form, which was a joke he's long forgotten. However, he is now stuck in that configuration. The Malebolgia took away his shapeshifting powers to punish him for his over-zealous approach to training Al Simmons. The Violator is dangerous nonentheless. He is a yapping chihuahua with shark's teeth, a tiger with the brain of a squirrel, a chimp with a gun. He believes that one day his service to the Malebolgia will be rewarded. He believes that he'll get to become a Hellspawn as have so many men, and women, since before he was created. All he has to do is teach the Spawn how to use their powers and goad them into succumbing to the dark evil in their dead bodies... and do it without telling them directly, the better to add to their confusion. But who will instruct the Violator, to end his own confusion? His methods are base, mean and cruel. And wrong. He has yet to come close to his master's expectations, always foiling the best laid plans. But he has to prove himself, must prove to the Malebolgia that he is better than mere humans, a better choice to be a Spawn. One day, he tells himself often, he'll get up the courage to tell "the boss" what he feels. One day real soon. He's been saying that for fifteen hundred years.